Among the most prevalent uses of Christian music are in church worship or other gatherings. Most Christian music involves singing, whether by the whole congregation (assembly), or by a specialized subgroup—such as a soloist, duet, trio, quartet, madrigal, choir, or worship band— or both. It is frequently accompanied by instruments, but some denominations (such as some Exclusive Brethren, the Churches of Christ, the Primitive Baptists and the Free Church of Scotland) or congregations still prefer unaccompanied or a cappella singing. Some groups, such as the Bruderhof, sing songs both with religious and non-religious meanings and words. For them, the act of singing is important. One of the earliest forms of worship music in the church was the Gregorian chant. Pope Gregory I, while not the inventor of chant, was acknowledged as the first person to order such music in the church, hinting the name "Gregorian" chant. The chant reform took place around 590–604 CE (reign of Pope Gregory I) (Kamien, pg. 65–67). The Gregorian chant was known for its very monophonic sound. Believing that complexity had a tendency to create cacophony, which ruined the music, Gregory I kept things very simple with the chant. 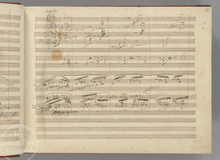 A page (leaf 12 recto) from Beethoven's manuscript. Catholic monks developed the first forms of modern Western musical notation in order to standardize liturgy throughout the worldwide church, and an enormous body of religious music has been composed for it through the ages. This led directly to the emergence and development of European classical music, and its many derivatives. The Baroque style, which encompassed music, art, and architecture, was particularly encouraged by the post-Reformation Catholic Church as such forms offered a means of religious expression that was stirring and emotional, intended to stimulate religious fervor. In the West, the majority of Christian denominations use instruments such as an organ, piano, electronic keyboard, guitar, or other accompaniment, and occasionally by a band or orchestra, to accompany the singing. But some churches have historically not used instruments, citing their absence from the New Testament. During the last century or so several of these groups have revised this stance. The singing of the Eastern Orthodox is also generally unaccompanied, though in the United States organs are sometimes used as a result of Western influence. Some worship music may be unsung, simply instrumental. During the Baroque period in Europe, the chorale prelude (for organ) was widely used, generally composed by using a popular hymn tune thematically, and a wide corpus of other solo organ music began to develop across Europe. Some of the most well-known exponents of such organ compositions include Johann Sebastian Bach, Dieterich Buxtehude, George Frideric Handel, François Couperin, César Franck and Charles-Marie Widor to name a few. Up to the present time, various composers have written instrumental (often organ) music as acts of worship, including well known organ repertoire by composers like Olivier Messiaen, Louis Vierne, Maurice Duruflé, and Jean Langlais. The church sonata (for orchestra and chamber group) and other sacred instrumental musical forms also developed from the Baroque period onwards. Called Christian pop or gospel in a generalized form, this is a relatively new musical movement and has now evolved into a large number of musical genres by region that comes in a Christian context. This movement appeared as a form of evangelization for the young but the genre is best known and seen in the Evangelical or Protestant proselytizing movements, often using rhythms similar to those in secular music. In the 1980s and 1990s, contemporary Christian music played a significant role in Evangelical Christian worship. A great variety of musical styles has developed traditional praise. Similar developments took place in other language, for example the German Neues Geistliches Lied and Korean Contemporary Christian music. Christian music is supported by a segment of the general music industry which evolved as a parallel structure to the same. Beginning in the 1970s and developing out of the Jesus movement, the Christian music industry subsequently developed into a near-billion dollar enterprise. By the 1990s the genre had eclipsed classical, jazz, and new-age music, and artists began gaining acceptance in the general market. Christian Musicals is another growing area, especially with the help of the internet. Church drama groups frequently enjoy performing musical dramas which can be downloaded on-line for free use. In the US several Christian music festivals have been organized. They are common in the summertime and draw many different people, specifically those from organized groups such as church youth groups and campus groups. In addition to music festivals like those that are part of the Christian Festival Association, there are also many Christian conferences which focus more on speakers, but usually also have musical performances, especially for a Worship service. The Ichthus Music Festival started in 1970. Today festivals are held annually around the world, and may draw upwards of 100,000 people. New Zealand's Parachute Music Festival, the largest Christian music festival in the Southern Hemisphere, began in 1989 and is held annually at Mystery Creek Events Centre outside the city of Hamilton. England's Big Church Day Out Festival began in 2009 and has annual attendance of approximately 20,000. Like any musical group or act, many Christian musical artists perform concerts in concert halls, bars & clubs, or outdoor venues, as well as in church-related venues. Sometimes it may be for pure entertainment, other times with the intention of witnessing (evangelizing by bearing witness of one's faith), and other times may be part worship as well. ^ Kamien, Roger. Music: An Appreciation. 9th ed. New York, New York: McGraw-Hill, 2008. Print. ^ Steve Turner (2008-02-27). "Obituary: Larry Norman | Music". London: The Guardian. Retrieved 2011-09-27. ^ "Christian Musicals". Gospel Musicals. Retrieved 29 September 2012. ^ "Big Church Day Out". Big Church Day Out. Archived from the original on 15 August 2012. Retrieved 17 August 2012. Darden, Robert, People Get Ready: A New History of Black Gospel Music Continuum International Publishing Group, 2005, ISBN 0-8264-1752-3. Herbermann, Charles, ed. (1913). "Ecclesiastical Music" . Catholic Encyclopedia. New York: Robert Appleton Company. Wilson-Dickson, Andrew (2003). The Story of Christian Music: An Illustrated Guide to All the Major Traditions of Music in Worship. Oxford: Lion. ISBN 978-0-7459-5119-5. Wikimedia Commons has media related to Christian music. "Free and open academic meta-engine of latin manuscripts and music sheets" (in Latin, English, French, and Spanish).